Sell Faulty Car to Car Wrecker NZ. The reason is simple we are #1 Faulty Car Buyer in New Zealand. We are covering mainly towns and cities Waikato, Bay of Plenty and Taranaki. 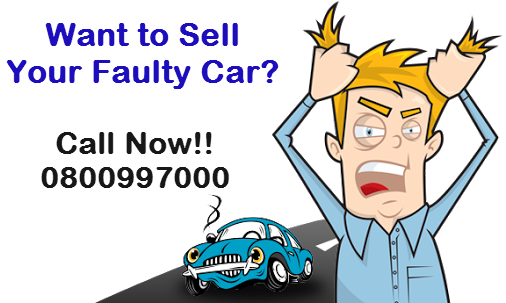 Sell Faulty Car is a programme designed for those people who get's trouble in selling there Faulty Car privately. So, do not get headache trying to Dispose of your Faulty, Unwanted or Damaged Vehicle. Try Car Wrecker NZ instead. We are here to make the entire process of Getting Rid of the Faulty Car HASSLE-FREE. How We Remove Faulty vehicles? We make Selling Your Car SIMPLE. If the vehicle is Not-Driveable, Damaged, Running or Not. Just fill out our online request for quote form or Call us on 0800997000. We will get back to you as soon as possible with a Free No Obligation Quotation. How much I get for Selling Faulty Car? When it comes to getting Cash Value for your Faulty, Damaged or Broken Car, Ute, Van, Suv or Truck. Car Wrecker NZ is #1 Trusted Faulty Vehicle Buyer in Waikato, Bay of Plenty and Taranaki. We Pay Highest Value for Your Faulty Vehicle. We keep our promise by paying Decent Money for Your Faulty Car. Our valuation expert are trained and knowledgeable and We give most correct Valuation for Your Car. We are the Easy and Secure way to Recycle or Dispose of Your Vehicle – and whatever the reason, whatever the damage, you will get the Highest Trade Price possible. We are quick too. In most of the cases we take the Faulty Vehicle off your property within 24 hours. Sell Faulty Car programme covers all cities and towns in Waikato, Bay of Plenty and Taranaki. Some of the main towns and cities we cover are Hamilton, Rotorua, Tauranga, Huntly, Ngaruawahia, Cambridge, Matamata, Te Kuiti Tamahere, Te Awamutu, Leamington, Tirua, Putaruru, Tokoroa, Taupo, Te Puke, Katikati, Otorohanga, Whakatane, Morrinsville, Paeroa, Waihi, Thames, Papamoa, Mount Maunganui, Kawerau, Opotiki, Mangakino, Turangi, Taumarunui, Wairoa, New Plymouth, Waitara, Stratford, Hawera. If you could not find your place. NO WORRIES!! Give us a call on 0800997000. To Sell Faulty Car and Removal. Call Now!! 0800997000. CASH PAID TODAY! !